The Bezoar Ibex,in Turkey,is one of the most beautiful mountain goats of the world with its magnificent curved horns,black,long nice beard and a very nice black striped cape over its shoulder(just males during the rut time).Can be easily hunt in our country combining with many more possibilities like wild boar,chamois,red stag,roe deer,hybrid Ibex hunts or sightseeing opportunities alone or with your family. Sometimes can stay in a luxury hotels,town hotels,village houses or in a tent depends to the hunting area.And can hunt very big trophies in Turkey depending to the quality of the hunting area up to over 150cm. The average altitude of the hunting areas are around 1000m-2000m from the sea level. 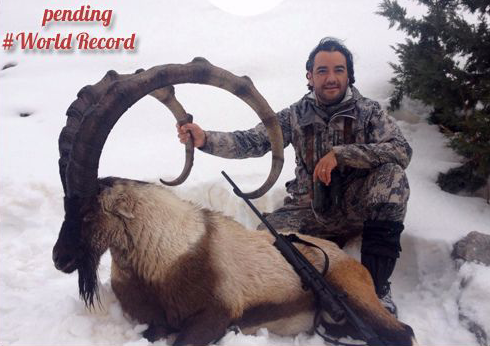 Every year we get first class permits from the government to be able to arrange you a first class hunting with big trophies of Bezoar Ibex such as Adana,Mersin,Mugla,Artvin and Mersin Areas in Turkey where we also shot a record ibex of 141,5cm with our American hunter William McClure. The avarage weighs of these beautiful animals,males are around 80-100 kg. We hunt many huge trophies every year over 120cm,48inches. In Bezoar Ibex hunt the best time is the rut time which it starts from late October to mid-January due to the hunting areas and weather conditions.In some regions October can be the best or in some regions mid-January can be the best time for bezoar ibex hunting.March is also good month to hunt bezoar ibex,just before the end of the season,after a strong winter can find huge animals at a accessible areas while they are looking for a fresh food.